Found 46 file extension associations related to Kaspersky Anti-Virus and 17 file formats developed specifically for use with Kaspersky Anti-Virus. 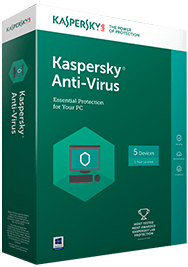 Kaspersky Anti-Virus delivers essential antivirus technologies for your PC – with real-time, cloud-assisted protection against the latest malware threats. Working ‘behind the scenes’ – with intelligent virus scanning and small, frequent updates – it proactively defends your PC against both known and emerging threats, without any significant impact on your PC’s performance. If you need more information please contact the developers of Kaspersky Anti-Virus (Kaspersky Lab), or check out their product website.